On December 25, 2017, Pope Francis prayed for the children of the world. 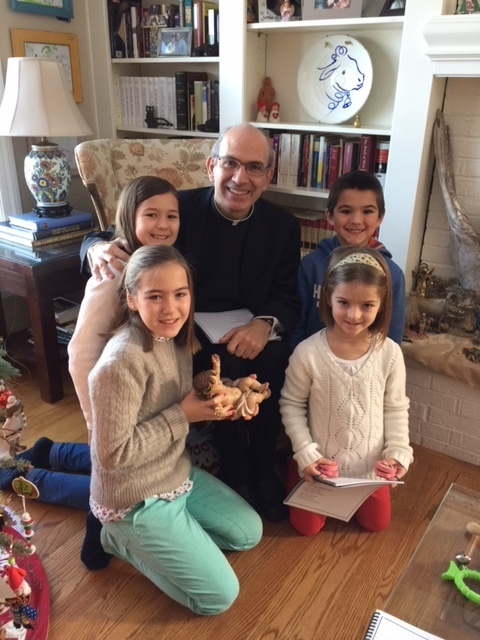 He said that “Christmas invites us to focus on the sign of the Child and to recognize him in the faces of little children, especially those for whom, like Jesus, “there is no place in the inn”” (Lk 2:7). This made me think of the numerous children who do not have access to good schools, and to the many parents who neglect their education. Newman believed that parents should be the primary educators of their children.This sounds obvious but in the twentieth century and the first two decades of the twenty-first this is no longer so to anyone. Television, movies and social media are their prime educators; and many parents are not involved at all in their education, but think that by putting them in a Catholic school they have fulfilled in large measure their responsibility. Already in the nineteenth century Newman insisted that parents act as the primary educators of their children. In May 1859, together with a group of parents he opened a school for boys which in time came to be called the Oratory School. The parents looked up to him to prepare their boys for a university education and, later, employment in society. But from the beginning Newman insisted that the parents should raise the needed money for opening and running the school. In fact, he did not want the Birmingham Oratory to be responsible financially or even administratively. When a sufficient number of parents agreed to fund the school and had discussed the principles and objectives for the school, Newman agreed to found it and thus, with his reputation, to draw families and their children to the school, and to ask the Oratory to provide a provisional headmaster. It was a boarding school for boys founded along the lines of the elite English public schools, but which were not public in the sense of schools in the United States, but with the religious and disciplinary line of Catholic seminaries. Newman wanted the school to be a “Catholic” Eton where the boys had the freedom of famous Eton College together with the best religious formation of the Catholic schools. The participation of the parents was much more than financial. Newman involved them by writing them frequent letters with information on the progress of their children during the year, and by pointing out corrections that the children required. He also asked the parents to guide their summer studies, and discussed with them plans for their future university or professional studies. In other words, the parents were fully engaged in the education of their children. The younger boys at the school lived in various houses, each run by a woman called a matron who acted like their mother and who cared for their health and hygiene, and provided them with the necessary meals and affection. Newman chose good teachers, including the young poet Gerard Manley Hopkins, and the academics were demanding. He opened a library for the students, established various prizes for learning competitions, and organized representation of classical plays with scripts adapted to remove immoral content. The religious formation of the children was an important part of the education as were religious practices such as daily Mass and prayer of the rosary. These practices were, however, optional because Newman underlined the value of education in freedom and responsibility. Earlier on the most famous student was Hilaire Belloc, later a celebrated writer. Another distinguished writer, J.R.R. Tolkien, did not study at the Oratory School, but shortly after Newman’s death, was educated with the help of the same Oratorian Fathers in Birmingham. As we begin the New Year 2018, we think of the countless young people who attend schools with poor teaching standards or whose parents are not involved in their education. 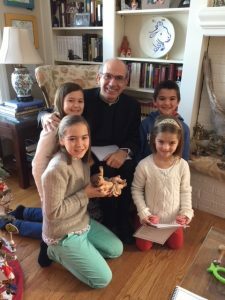 With the inspiration of educators such as John Henry Newman, John Bosco, Josemaría Escrivá and, before them, Ignatius of Loyola, parents are challenged to see and embrace the vital role they have as their children’s primary educators. And all of us should consider how to support educational enterprises financially, and teaching or volunteering in various capacities. With the intercession of the Holy Family we will help many children to grow and develop as God’s children. Very good message for parents AND grandparents to live Christian virtues which will teach our children more than anything we can say, and to be involved physically, intellectually and financially in their education at home as well as at school.